In a previous article, we remarked on how strange it was for Nintendo to release a special Majora’s Mask version of the New Nintendo 3DS XL, without an actual copy of the game. Well, it turns out that the special edition New Nintendo 3DS XL releasing in the UK will come with Majora’s Mask 3D software pre-installed. 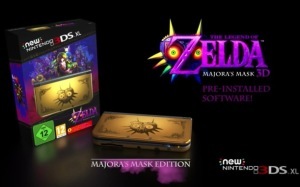 There’s no word on whether the 3DS will be included in other Majora’s Mask 3D bundles, so those who want the goodies that go along with the bundle will as of now end up with two copies of the game. Are those in the UK happy to hear that the software will be pre-installed? What do you think of the console? Let us know in the comments!